Muscle tension is influenced by the number of cross-bridges that can be formed. The more cross-bridges that are formed, the more tension in the muscle. The amount of tension produced depends on the cross-sectional area of the muscle fiber and the frequency of neural stimulation. Maximal tension occurs when thick and thin filaments overlap to the greatest degree within a sarcomere; less tension is produced when the sarcomere is stretched. If more motor neurons are stimulated, more myofibers contract, and there is greater tension in the muscle. 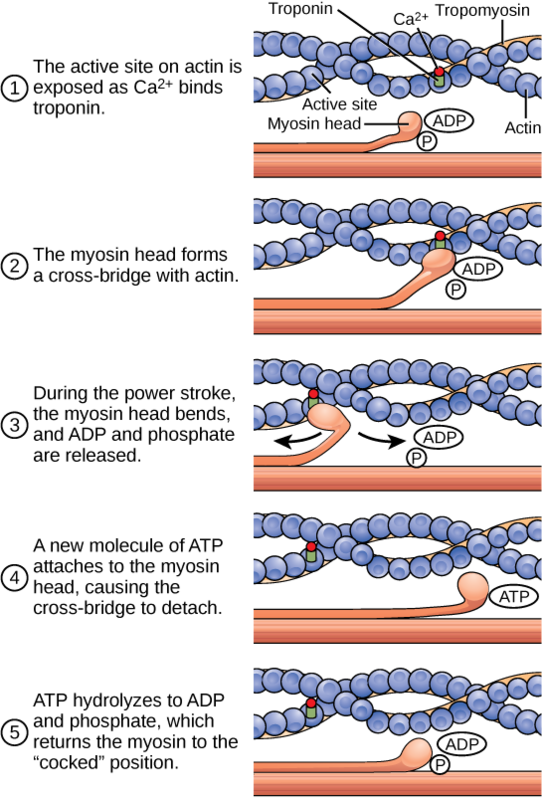 Neural control initiates the formation of actin – myosin cross-bridges, leading to the sarcomere shortening involved in muscle contraction. These contractions extend from the muscle fiber through connective tissue to pull on bones, causing skeletal movement. The pull exerted by a muscle is called tension. The amount of force created by this tension can vary, which enables the same muscles to move very light objects and very heavy objects. In individual muscle fibers, the amount of tension produced depends primarily on the amount of cross-bridges formed, which is influenced by the cross-sectional area of the muscle fiber and the frequency of neural stimulation. Muscle tension: Muscle tension is produced when the maximum amount of cross-bridges are formed, either within a muscle with a large diameter or when the maximum number of muscle fibers are stimulated. Muscle tone is residual muscle tension that resists passive stretching during the resting phase. The number of cross-bridges formed between actin and myosin determine the amount of tension that a muscle fiber can produce. Cross-bridges can only form where thick and thin filaments overlap, allowing myosin to bind to actin. If more cross-bridges are formed, more myosin will pull on actin and more tension will be produced. Maximal tension occurs when thick and thin filaments overlap to the greatest degree within a sarcomere. If a sarcomere at rest is stretched past an ideal resting length, thick and thin filaments do not overlap to the greatest degree so fewer cross-bridges can form. This results in fewer myosin heads pulling on actin and less muscle tension. As a sarcomere shortens, the zone of overlap reduces as the thin filaments reach the H zone, which is composed of myosin tails. Because myosin heads form cross-bridges, actin will not bind to myosin in this zone, reducing the tension produced by the myofiber. If the sarcomere is shortened even more, thin filaments begin to overlap with each other, reducing cross-bridge formation even further, and producing even less tension. Conversely, if the sarcomere is stretched to the point at which thick and thin filaments do not overlap at all, no cross-bridges are formed and no tension is produced. This amount of stretching does not usually occur because accessory proteins, internal sensory nerves, and connective tissue oppose extreme stretching. The primary variable determining force production is the number of myofibers (long muscle cells) within the muscle that receive an action potential from the neuron that controls that fiber. When using the biceps to pick up a pencil, for example, the motor cortex of the brain only signals a few neurons of the biceps so only a few myofibers respond. In vertebrates, each myofiber responds fully if stimulated. On the other hand, when picking up a piano, the motor cortex signals all of the neurons in the biceps so that every myofiber participates. This is close to the maximum force the muscle can produce. As mentioned above, increasing the frequency of action potentials (the number of signals per second) can increase the force a bit more because the tropomyosin is flooded with calcium.